Martin Papworth’s many roles; coach, umpire, team selector, groundsman, general organizer of junior and senior cricket and even as a variable medium pace bowler, came to play as he played against the Singapore Cricket’s Social team. Here he is seen with 16 year old teammate Chanchai. Martin Papworth has been at the forefront of cricket in Chiang Mai for most of the last decade in a multitude of roles ranging from coach, umpire, team selector, groundsman, general organizer of junior and senior cricket and even as a variable medium pace bowler, but never has he had a day the Saturday in March when Gymkhana Club took on the might of Singapore Cricket Club’s social team. Chanchai got on focus thanks to Martin’s coaching skills. He had arrived early in the morning to finish his work on the pitch and then changed into his umpire’s uniform ready for a day’s officiating when he realized one of the eleven he had selected to play had not yet arrived, so he promoted himself into the team and as he was changing into his whites, veteran captain Pete Warner asked the occasional tail-end batsman if he would like to open. Martin is a regular at the nets, as he is also responsible for holding the twice weekly net practices at Gymkhana, and he always has his bat first as he is normally the first to arrive. Practise makes perfect and at last he had his chance to show his credentials as a dependable opening batsman as Gymkhana Club had won the toss and were batting first. Papworth walked to the crease with Chris Coombes and watched him lose his wicket for just 10. 16-year-old Chanchai has been making runs on a regular basis but the novice opener reverted to his role as experienced coach as he gave instructions for the young Thai to keep his head down and keep the ball on the ground. Chanchai clearly wasn’t listening as he went for his shots and was lucky not to be caught out on a number of occasions early in his innings but he played with great fluency while Martin was able to take his own advice and to build an innings with great patience. 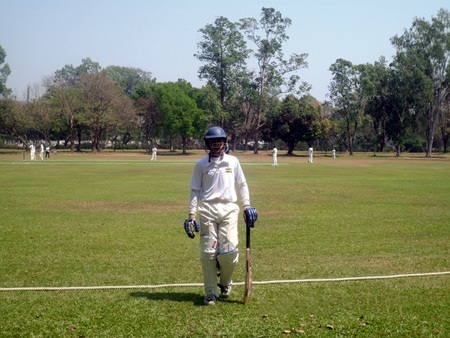 Chanchai raced to his fifty from 37 balls with nine fours and is clearly a great talent in the making although he will face more testing bowling attacks and the chances he gave will be taken on other days. Martin had been looking confident with four boundaries in his first 30 runs and he also played a trio of drives into the off-side from consecutive balls that each brought him two runs which showed off his technique to the full. But just as Papworth began to realize that a prized personal landmark was approaching he began to have problems with his timing as the pitch was keeping low and the ball was getting soft. Each run became a struggle and he was beginning to run out of time in this 30-over match when he ran out Gary Chatfield after calling for a run after he hit the ball back to the bowler. With Martin marooned on 46, at last there was a loose ball for him to leg-glance but the fielder just gathered in the ball with three runs scored and he repeated the shot in the next over, only for the umpire to signal leg-byes, but at last he did manage to push away the single which brought him the first fifty of a long and determined career, and he just had the strength to lift his bat and to walk off the field with a big smile on his face. Martin had faced 74 balls, batted for 104 minutes and hit four boundaries and he had played an admirable sheet anchor role as Gymkhana Club reached a total of 191 for 5 in their 30 overs but he didn’t have much time to celebrate before Singapore began their reply. Both Gymkhana opening bowlers, Khurram Rauf and Eddie Joyner, operated from short runs and both bowled their six overs straight off. Khurram bowled with good accuracy and with useful pace but it was Joyner who dismissed both openers, John Thornback and Rohit Shah who made 35. Singapore were behind the rate and their middle-order proved unable to deal with the gentle flighted off-spin propelled by Tom Salusbury as he claimed two wickets bowled, one caught and bowled and one stumped to finish with figures of 4 for 35. On any other day his performance would have made the headlines but he was pleased as punch with his four wickets after being hit out of the attack the previous week. With seven wickets down, some resistance came from wicket-keeper Martin Seabright and tall fast bowler Matthew Streeton but Gary Chatfield brought a quick end to proceedings as he collected the last three wickets as Singapore were bowled out for 158. Gymkhana Club had won the match by 33 runs and Chanchai was presented with a polo shirt for being junior of the day, but man of the day was clearly Martin Papworth after his marathon performance with the bat had brought to an end a very long wait for a cherished milestone. Cricket took a well-deserved break after all the excitement of the Sixes and the school holidays saw many of the hill tribe children go back to visit their villages, but the month of May will see a series of fixtures against touring sides. The Sri Lankan Navy are visiting over the weekend of 10th and 11th May and the 50-over match planned for the Saturday at Prem Oval will see the best cricketers in Chiang Mai take on a side which plays in the first-class competition in Sri Lanka. 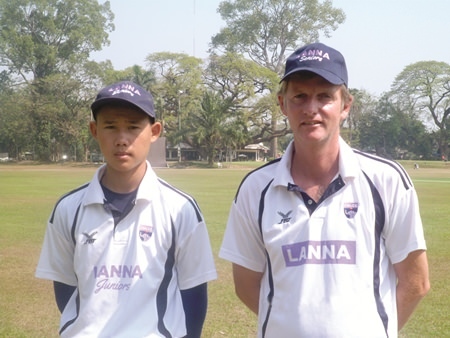 The following weekend will see the visit of Lamma CC from Hong Kong and it is hoped that a side from Malaysia will also tour before the end of the month as Chiang Mai continues to be a favourite destination for a variety of touring teams. Governor Wichien Puthiwinyoo received donations from Siam Sport for needy schools and foundations in Chiang Mai on April 23, 2014. The company has organized nationwide donations to celebrate their 40th anniversary. Students in Chiang Mai will receive books and sports equipment thanks to a donation by Siam Sport on April 23, 2014. Chiang Mai Governor Wichien Puthiwinyoo was on hand to receive the donations to be distributed around the province to needy schools. Siam Sport Syndicate Public Company Limited launched the nationwide donation project to celebrate the company’s 40th anniversary this year. The company has been working with PTT Public Co Ltd as well as Toyota, iMobile, Honda Motorcycle SCG and FBT to coordinate the donations. The company wants to give back to the community and inspire youth in Thailand to make their dreams come true to become athletes,. The company has also donated picture books on their 40th anniversary, as well as produced the show Sports Wow which shows 8 top Thai athletes visiting schools around Thailand meeting kids and donating books and sporting equipment to schools and to foundations for disabled children. 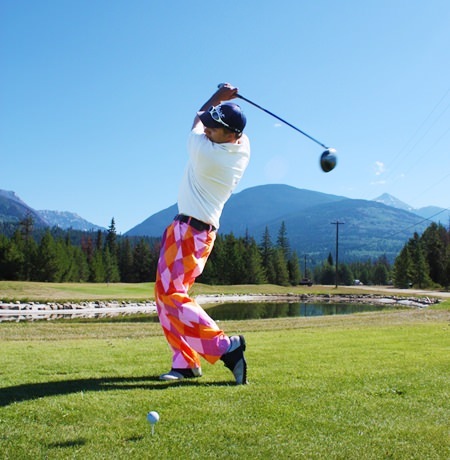 Bangkok Airways will offer golfers who travel between Bangkok – Chiang Mai to participate in “Chiang Mai Golf Festival 2014”. An extra 10kg baggage allowance will be offered on top of the regular limit of 20kg at check-in. This offer will be available during 1 May – 30 June 2014. Currently, Bangkok Airways operate 7 daily flights between Bangkok – Chiang Mai. The Chiang Mai Golf Festival 2014 is being held in May and June to promote golfing tourism to Chiang Mai and to give golfers the chance to compete and play on eight different golf courses. The Festival began on May 1, 2014 at Chiang Mai Highlands Golf & Spa Resort will continue on May 10 at Mae Jo Golf Resort & Spa, May 24 at Star Dome Golf Club, May 31 at Summit Green Valley Chiangmai Country Club, June 7 at The Royal Chiangmai Golf Resort, June 14 at Alpine Golf Resort - Chiang Mai, June 21 at Gold Canyon Golf Resort and June 28 at Chiangmai Inthanon Golf and Natural Resort. According to a recent finding by the University of the Thai Chamber of Commerce (UTCC), Thai soccer fans are willing to shell out around 60 billion baht on World Cup merchandise each time the season begins, effectively breathing life into local vendors at the time of sluggish economy threatened by months of political conflict. The finding suggested that each World Cup stimulates spending of around 50-60 billion baht, depending on economic conditions at the time. Business revenue is usually spurred by public spending on commodities and recreational items related to the football matches, television sets, as well as other products and services offered in the promotional campaigns.